Halifax Regional Police have announced that officers will not be participating in the march through the city’s downtown core, saying their participation could contribute to divisions in the LGBT community. There will be something missing from this year's Halifax Pride parade: police. Halifax Regional Police have announced that the force will not be participating in the march through the city's downtown core on July 22. Individual officers will still be permitted to walk, but not in uniform and not as part of an official police presence. The move is in response to what's been described as a national debate about police participation in Pride parades and follows what Chief Jean-Michel Blais said was several months of discussion with Halifax Pride. "We recognized that our participation in the parade may contribute to divisions in the LGBT2Q+ community, which is contrary to our intent of building a strong and sustainable relationship," Blais said in a statement. The executive director of Halifax Pride supported what he called a proactive decision. "To my knowledge, HRP is the first police service in Canada to take this community-minded approach to its Pride participation," Adam Reid said in the same statement. When later pressed at a news conference, Reid could not provide any specific complaints about Halifax police participation in the parade. "No, off the top of my head, I can't think of any specific comments that have come forward," he said. "But I do know that there is a debate on the matter and HRP is aware of that and have taken that into consideration." There's been growing controversy in some Canadian cities about police officers marching in Pride parades. Last month, Pride organizers in Toronto said they would ban uniformed officers from the parade. The move follows demands made last summer by the organization Black Lives Matter, which accused police of targeting the city's black residents. It also accused Toronto Pride of showing "little honour to black queer/trans communities, and other marginalized communities." "It's not because [of] what's happening in Toronto per se," Blais told reporters. "We recognize the issues that occurred in Toronto are in Toronto. … Some of the other issues we recognize is that there has been charges levelled that there has been a history of brutality, a history of crimes by police against this community, when, in fact, there hasn't been that history." Halifax police will look at other ways to participate in Pride activities. Suggestions include a barbecue or a public lecture. 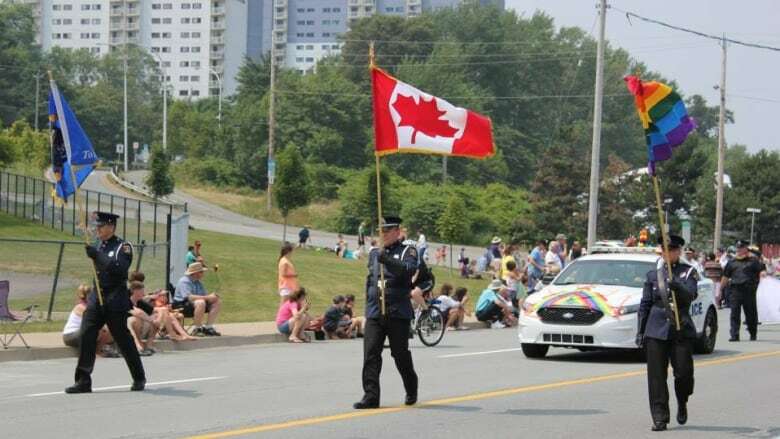 Police will still provide traffic control for the parade, which begins at the Halifax naval dockyard and travels along Barrington Street and Spring Garden Road, before ending near the Halifax Common. Pride organizers have not yet had a chance to discuss RCMP involvement in this year's parade, Reid said, adding that they hope to do so in the coming days.